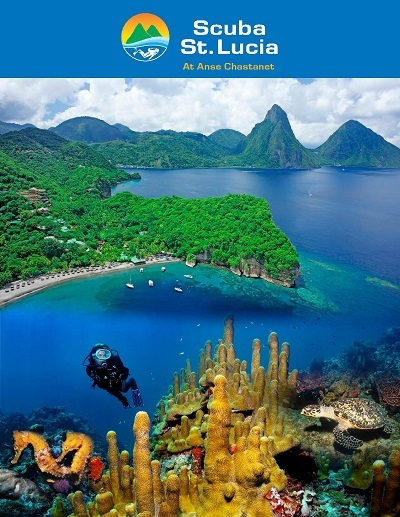 SCUBA ST LUCIA caters predominantly to diving guests staying at ANSE CHASTANET RESORT and JADE MOUNTAIN. ANSE CHASTANET and JADE MOUNTAIN are in one of the most scenic settings the Caribbean has to offer. Pleaes read more about these two fine resorts below. If you are staying elsewhere SCUBA ST LUCIA welcomes non resident guests to dive with us, space permitting. We can arrange transportation from the north of the island. Please contact us. 7 nts run of house accommodation, airport transfers, breakfast, lunch, afternoon tea and dinner, all tax/service, welcome drink and culinary amenity on arrival, 12 beach or boat dives incl of tank, weights, belt, mask, snorkel, fins ( other equipment at a charge if needed, marine park fee to be paid locally ) comp non motorized watersports. This is our most favorably priced dive package. Run of House accommodation means that no specific room category is confirmed or guaranteed to you. The assignment of a room will happen at check in and could be any of the 4 hotel categories. In most cases a superior room will be assigned. Should you wish to secure a specific room type we would need to base your reservation on our CORAL KALEIDOSCOPE package which is similar in nature, but is priced by room type. ANSE CHASTANET: Nestled amidst a 600 acre tropical estate with two soft sand beaches bordering on pristine coral reefs, ANSE CHASTANET is in complete harmony with its natural surroundings and right in the heart of the island's marine reserves. ANSE CHASTANET enjoys a unique hillside-beachside location with 49 individually designed rooms and 24 spectacular Infinity pool sanctuaries each with their own vanishing edge pool located on the very top of the property. Resort facilities include two restaurants/bars serving Tropical World Cuisine created by a team of award winning chefs , the Kai Belté spa, mountain bike facility with Cannondale bikes and 12 miles of private trails, the 42 ft sailing yacht, boutiques, library and art gallery. The resort diving operation SCUBA ST.LUCIA caters to beginners and experienced divers alike Nitrox is available. Beach, boat, wall and wreck diving are all offered. The night dives right on the ANSE CHASTANET reef are a highlight for any diver. Look for THE THING! JADE MOUNTAIN: Rising majestically above the 600 acre beach front resort of Anse Chastanet, Jade Mountain is a cornucopia of organic architecture celebrating St Lucia's stunning scenic beauty. The bold architectural design – individual bridges leading to exceptional infinity pool sanctuaries and rugged stoned-faced columns reaching towards the sky – makes Jade Mountain one of the Caribbean's most mesmerizing resort experiences. 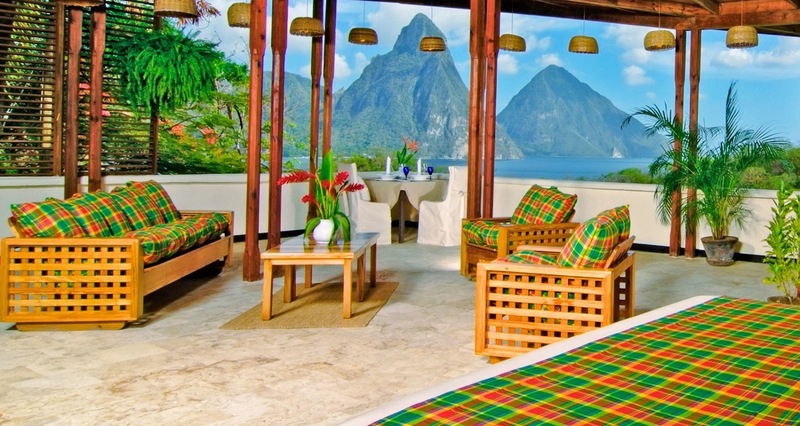 Enjoy the exclusivity and privacy of Jade Mountain plus all of Anse Chastanet's restaurants, bars, boutiques, art gallery, spa, scuba, bike and watersports facilities as well as 2 soft sand beaches available to Jade Mountain guests at all times. If you are interested in a Jade Mountain dive deal please contact us. If you are staying in the northern part of the island looking for a scuba day excursion or if you are arriving on a cruiseship and are looking for a St.Lucia day shore excursion, please contact us via scuba@ansechastanet.com or call 1 -800-223-1108 and we will forward information to you. 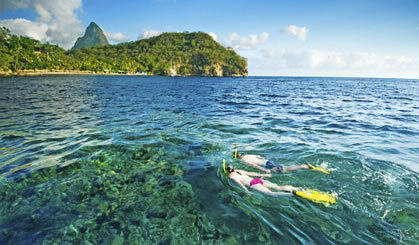 We offer St.Lucia scuba diving and snorkel day excursions, including pick up and drop off in the north of island. Our boat will leave from Castries harbor and drop you there again around 3.30 p.m. Available on three days weekly.